This is Rai Music from Algeria as you've not heard it before. In the early 1970's, a new group of singers and musicians were operating on the northwest coast and what they pioneered was a sound that eventually reached worldwide status by the end of the decade, however their names are relatively unknown to this day outside Algeria. This crucial and defining period of the development of Rai is criminally ignored and overlooked by Algerian music historians and Raï's fans. Due to censorship and government controlled music diffusion, this scene and lyrical style was forced underground and banned from broadcasts yet slowly built a small following around the seaside cabarets of Wahran (Oran). 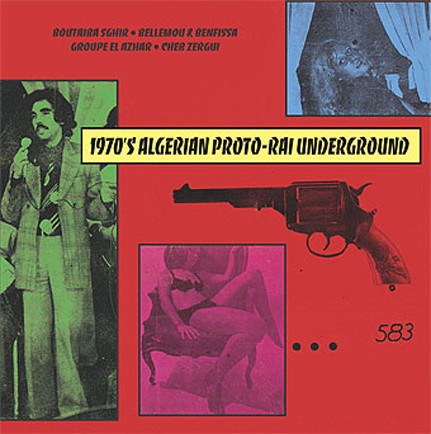 The early 1970's witnessed the rise of artists such as Groupe El Azhar ("The Flowers" group) and Messaoud Bellemou, who can comfortably be considered the godfather of the modern Raï's sound. His group, L'Orchestre Bellemou, rewrote a heritage of centuries by using modern instruments and especially the trumpet which became, during the 1970's, the backbone of the Wahrani genre. Reinterpreting the gasba melodies on trumpet, Bellemou backed singers such as Boutaiba Sghir & Sheikh Benfissa who carried on the lyrical tradition of their forefathers singing about daily preoccupations and problems as well as love affairs, alcohol, or simply owning an automobile! Toward the late 1970's, Cheb Zergui brought a newer ingredient: an electric guitar with a wah wah pedal. Thankfully, the late 1960's saw the development of vinyl pressing in Algeria. This new industry allowed many small artists including the Wahrani "scene" to record and release singles documenting their repertoire. This compilation is a selection of the Proto Raï's scene's vinyl 45s. The LP is limited to a one-time pressing of 1500 copies on 180 gram vinyl and comes in a full color gatefold jacket with photos of the musicians & informative liner notes by the man who compiled it, Hicham Chadly.